After 4 years of development and testing, MRF Engineering created their Motorsport sub-frame bushings to solve a commonly known problem amongst the E9x BMW chassis. 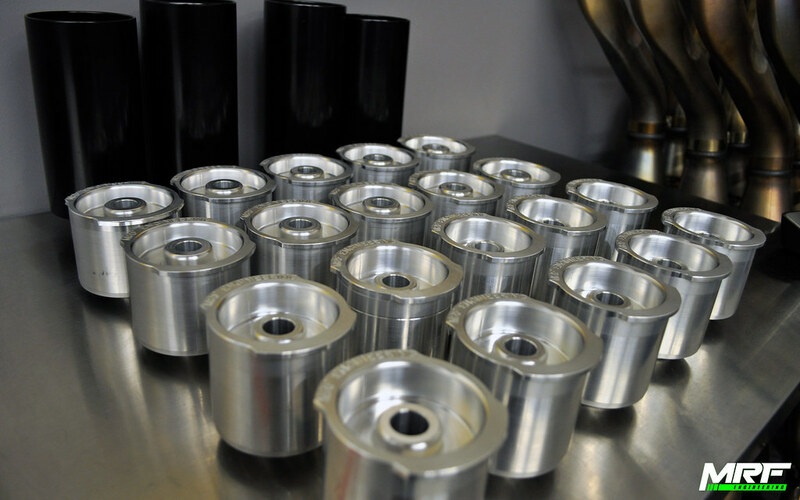 Under high loads or aggressive driving, the rubber mounted factory bushings exhibit high amounts of deflection resulting in geometry changes that pose a negative effect on handling and stability. Consequently, this very same deflection also causes the sub-frame to become unstable resulting in very violent axle-hop (commonly known as “wheel hop”). In many instances, especially on Manual Transmission cars, this causes the differential and sub-frame to exhibit opposing forces, causing the differential mount and hardware to snap, causing differential mount failure and in most cases, catastrophic failure of the sub-frame resulting in a very expensive repair upwards of $8000! The MRF Engineering sub-frame bushings are very popular amongst the E9x BMW crowd, for both M and non-M vehicles. Customers all around the globe have come to appreciate the benefits of the MRF sub-frame bushings and continue to use their cars on roads and race-tracks all around the world with trouble free operation and never having to worry about damaging their sub-frame ever again. Contact MRF Engineering at sales@mrfengineering.com or by phone, 949-233-0448, to place your order today! Our bushings are always in stock and the most trusted, most used sub-frame bushings on the market today! Elimination of power delay when applying throttle. Instant power response to the wheels. Zero sub-frame deflection, eliminates wheel track changes between front and rear sub-frames to be better retain alignment. The provides better driver feedback and communication. Zero addition of vibration, noise or harshness (NVH). These bushings do not affect ride quality in a negative way! All new BMW M vehicles (including the M3 GTS and CRT) now employ a unitized sub-frame to the uni-body. Unlimited service life. The MRF bushings will never have to be replaced or serviced once installed for the life of the vehicle. Designed and manufactured in house to ensure 100% quality control over every bushing.